This waterbed mattress pad has generous pockets to help keep it on. It is quilted cotton and puffs up to about one-quarter of an inch on top. It fits the waterbed smoothly and will pay for itself in energy savings. 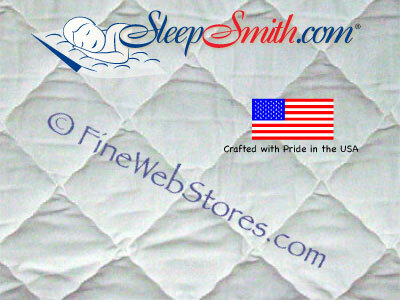 Mattress pads protect your mattress from damaging skin oils and is a line of defense against punctures. In addition, your skin needs breathing room from the vinyl mattress that a set of just waterbed sheets can not provide. This quilted mattress pad can be washed according to no-iron fabric rules. Slightly warm or cold wash with cold dryer settings or hang to dry. Available in super-single (48 in. x 84 in.) queen (60 in. x84 in.) and king (72 in. x 84 in.) waterbed sizes. Always measure inside of the waterbed frame. This waterbed mattress pad has generous pockets to help keep it on. It is quilted cotton and puffs up to about one-quarter of an inch on top. It fits the waterbed smoothly and will pay for itself in energy savings. Mattress pads protect your mattress from damaging skin oils and is a line of defense against punctures. In addition, your skin needs breathing room from the vinyl mattress that a set of just waterbed sheets can not provide. This quilted mattress pad can be washed according to no-iron fabric rules. Slightly warm or cold wash with cold dryer settings or hang to dry. Available in super-single (48 in. x 84 in.) queen (60 in. x84 in.) and king (72 in. x 84 in.) waterbed sizes.